So many important historical events have happened in and around the American south, so how do you know where to start? Let our professionals take care of that with this 4-day journey through the old south in eastern and central Alabama. Get ready for a historical adventure that will give you important facts about key places related to the Civil War, Civil Rights Movement, and early colonization of America. Take in beautifully preserved homes, scenic trails, and historic locations as you learn about the true old south and its importance in shaping the nation we know and love. Don’t worry, it’s not all work and no play for your group. With several fun learning opportunities along the way, including the grand finale of the tour, a hilarious dinner theater outing in the heart of historic Alabama, your group is sure to have a blast and learn something too! Kirkwood - Located in Eutaw, Alabama, your first stop will bring you to the Kirkwood historic plantation house. On the National Register of Historic Places, this Greek-revival style antebellum mansion was built by Foster Kirksey, a preeminent cotton planter in the area during the Civil War. Beginning in 1858, progress was put to a halt with the Civil War knocking at the door of the mansion. Though he was able to return to his home, most of Kirksey's fortune was spent during the war, and the house remained unfinished for the rest of Kirksey’s stay. This 8,000 square foot house has since then been finished and allows visitors to tour the inside operations of what was once a lively plantation. 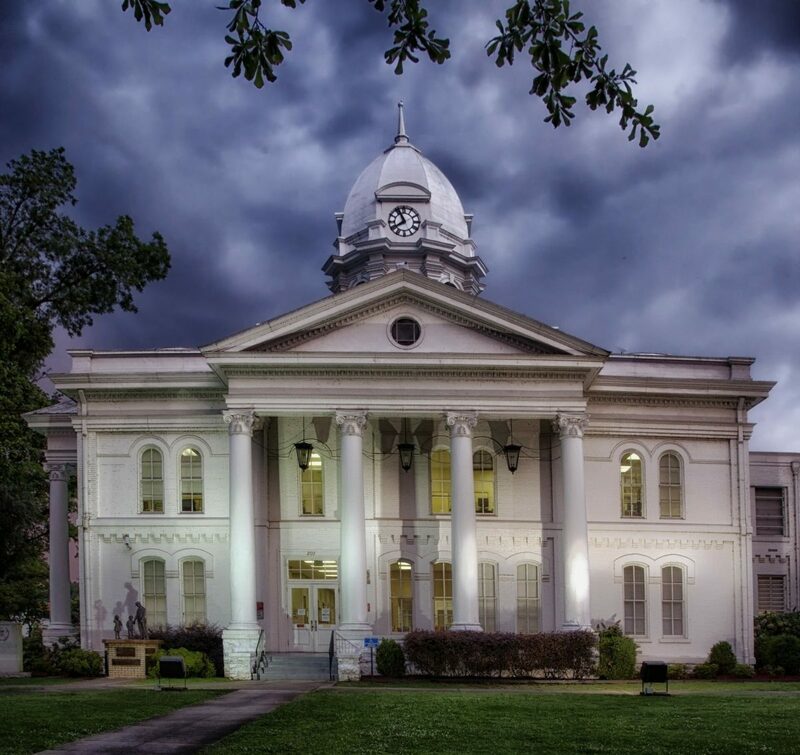 Demopolis - Your next stop will take your group to Demopolis, Alabama, a highly valued historic town that houses several significant homes and sites. Located in the Tombigbee and Black Warrior River district, this “city of the people” was an important merchant mecca, the town’s economy centered around exporting cotton. Originally settled by French exiles in 1817, this 92,000-acre city was first called the Vine and Olive Colony. Since the soil was fertile, located in the ‘black belt’ of the south, the French believed that planting olive branches would be a beneficial venture. Though it may not have worked as well as they thought, the cotton and timber industry boomed! Be sure to visit the historic public square, the oldest in Alabama (1819), and get a picture next to the iconic and picturesque confederate fountain and statue. Bluff Hall - Next stop, Bluff Hall! This Greek revival style federal townhouse was built in 1832. Local prominent plantation owner Allen Glover built this house as a gift to his daughter, Sarah Glover, and her husband. The townhouse sits atop a limestone cliff often referred to as White Bluff, with a great outlook of the Tombigbee River. Today the complex serves as a museum, displaying era-appropriate clothing, Victorian style furniture, and tons of local history exhibits. This stop will add great architectural, cultural, and even geographical knowledge to your ‘old south’ repertoire. Gaineswood - Last but certainly not least on this cultural adventure is a stop at Gaineswood Plantation. Registered as a national historic landmark, this Greek revival style mansion sits on a gorgeous 480 acres overlooking Demopolis. Though the exact date of completion is unknown, it is believed this mansion was built between 1843 and 1861 by Bryan Whitfield. Whitfield was a renaissance man and a successful cotton farmer. He named the property after George Strother Gaines, a man who played an important part in the local Choctaw removal and French exile Vine and Olive colonization. Make sure your group checks out the unique domed ceiling and southern stained glass features inside! Selma’s Old Town Historic District - Start your day at the largest historic district in the nation, with over 1,250 structures from the early 1800s listed on the National Historic Register. This 323-acre district on the Alabama River holds several examples of federal, Greek revival, Gothic, and Victorian style buildings and played an absolutely crucial role in the Civil Rights Movement. With the convenient river access, this area was an important commercial zone and was even used to manufacture war supplies during the Civil War. This district is also referred to when speaking of the Selma Movement in which 3,000 people were arrested on a mission to provide basic voting rights to everyone, regardless of color. Additionally, the infamous Bloody Sunday took place within this district as well, at the Edmund Pettus Bridge. Sturdivant Hall - “The finest example of Greek Revival Antebellum architecture in the Southeast,” according to a former White House interior designer, awaits your group next at the historic Sturdivant Hall. Built between 1852 and 1856, this townhouse was created for Col. Edward Watts, an important member of the confederate forces. This mansion features 10 rooms and sits on 6,000 square feet and at the time, it cost $69,000 to finish and boasted several worldwide pieces of art. During your tour, your group can marvel at the imported Italian marble, antique period furniture, priceless porcelain, or the many works of art around the property. There is also a gift shop and outdoor garden, but be careful on your way out, this site is popularly believed to be haunted. Museum staff and countless visitors have reported seeing a ghostly failed banker and his two daughters playing in the windows of the home, making this site an ‘America’s most haunted’ list representative as well. Water Avenue - Historic Water Avenue, located within the Selma historic district, is a street that features many sites, the most notable being the Edmund Pettus Bridge. This bridge is the site of multiple key events in the Civil Rights Movement, including the infamous Bloody Sunday. This failed march in 1965 was quickly and, in a few cases, violently ended at the bridge. However, soon afterward Martin Luther King, Jr. and a larger group of marchers, a few of which were helpful judges and lawyers, made it peacefully over the bridge on their way to Montgomery. Stand on the historic site of these key events or take in more local history at the Songs of Selma or Riverfront Parks on Water Avenue. St. James Hotel - Next your group will be able to check out St. James Hotel, built in 1837. Originally known as the Brantley Hotel after General John Brantley, this hotel served as a lodging and dining mecca for cotton and commercial merchants traveling along the river. In 1865, the Union took the hotel over and burned a great portion of the rest of Selma down, sparing this as a headquarter location. Afterward, Benjamin Turner, the first African-American man in congress, became manager until its demise in the late 1800s. Fully restored, this hotel is now an architectural restoration masterpiece on Water Avenue. It is also one of the locations making the ‘most haunted’ list, with a large group of visitors, workers, and guests claiming to have seen the ghost of a long ago St. James guest, Jesse James and his mistress. Enjoy the renovated Troupe Dining and Drinking rooms as you take in the magnificent history of this authentic antebellum hotel. Old Depot Museum - Also located on historic Water Avenue, the Old Depot Museum is an 1891 railway depot turned museum that features multiple artifacts and memorabilia encompassing the Civil Rights Movement. Actually, this museum’s range of exhibits and information spans from the prehistoric Native Americans of this area to post-Civil War era life in Alabama as well. Housing old rail cars, a Victorian firehouse, and horse-drew fire pump outdoors, the indoor portion of this Romanesque Revival style building show off the red brick and stone trimmed architecture that was popular during the era. Your group will learn more about the Confederate naval foundry that this was built on, as well as the old L&N Railroad that it serviced, giving them the ultimate cultural learning experience. State Capitol - Like the Civil Rights Movement marchers did, your next stop will take you from Selma to the doorsteps of the Alabama State Capitol in Montgomery. Completed in 1851, this building served as the location for the First Confederate Capitol, as Jefferson Davis was sworn in as the President of the Confederate States of America. The Selma March ended here as well at this Greek Revival style government building. Featuring many additional wings, as well as the original basement, this building sits on 9 acres atop Capitol Hill and serves as the current capital as well as a museum with exhibits featuring the role it played in early American development. First White House of Confederacy - End your day in Montgomery across the street at the historic home of Jefferson Davis, considered to be the First White House of the Confederacy. Built in 1835, this Italianate style home now houses original period pieces from the 1850’s and 1860’s and is utilized as a three-in-one learning center, teaching guests about the meager governmental beginnings of the Confederacy, the life of American patriot Jefferson Davis, and the importance of historical preservation. Serving as a government building for a mere 9 months, the building is more commonly remembered as the Davis’ residence, and tours inside will let your group know everything it needs to about the man, his family, and his life. Seth Lore Irwinton Historic District - Located a short distance away in Eufaula, this stop on your tour of the ‘old south’ is considered the second largest historic district in Alabama. Housing over 700 registered historical structures, the Irvington District is known to be Alabama’s most coherent collection of intact 19th-century small town commercial buildings. Small business, churches, and homes will all greet you on the high bluffs of Eufaula, as your group can step back into the past days of when this area was a bustling shipping and trade center along the river. Most of the buildings follow the Italianate style architecture, and the preservation involved in this community is visibly impressive. Fendall Hall - Sitting within the Irwinton Historic District you will find the Fendall Hall, known for its elaborate and rare interior design as a fine example of Italianate style structures. This 2-story wood framed home was built in 1860 by Edward and Anna Young, whose father was Captain Dent, a very important figure in the confederate forces. Inside, you will find period furniture, family treasures, and a very impressive marble mantel and entry way. Make your way around the 5-acre property as you take in the history of this location, including multiple beautiful gardens and various archaeological features. Shorter Mansion - Shorter Mansion was built in 1884 by Eli Shorter II and his wife Wiley. Serving as a social center, the Shorter Mansion pays homage to the classical revival style of architecture. Two stories tall with a masonry foundation, this home was actually remodeled in 1901-1906 which helped spark the preservation movement in Eufaula. The home is on the Eufaula pilgrimage tour and its 10,000 annual visitors can enjoy the well-preserved period furnishing indoors, as well as its 17 iconic free-standing Corinthian columns outside. Today the beautiful estate is used for weddings, luncheons, teas, historical society meetings, as well as a local and tourist education station for authentic Alabama history. Downtown Dothan - Historic downtown Dothan is a cultural blast from the past, immersing your group into the original trading and commerce community once referred to as Poplar Head. Settled next to the Poplar Head freshwater spring, many families, merchants, and war-torn passersby took to this destination for a drink and a rest. During the time of war, this community was terrorized by bandits and deserters, making confederate soldiers quick to defend it. Walk around the historic streets that held the cotton tax inspired ‘Dothan Riot’ or go view the historic Alabama Midland Railroad that boosted Dothan’s economy greatly in its time. Be sure your group checks out the large peanut statues throughout the town, serving as an homage to Dr. George Washington Carver, who also boosted this wiregrass dominant area by introducing peanuts to the black belt of Alabama. Landmark Park - Enjoy a relaxing stop in ‘the other south’ at the living history and science museum known as Landmark Park. This 135-acre natural park is considered to be a Museum of Agriculture for Alabama and features the plant that has made the wiregrass region what it is today. Within the park, your group will be able to visit a century-old drugstore with a working soda fountain, an original one-room schoolhouse, as well as the historic Dothan church. The area features naturally preserved areas, boardwalks, a planetarium, nature trails, and various historical structures. Guests are able to tour a portion of preserved cypress forest or visit a period authentic farm, featuring prominent crops such as corn, cotton, peanuts, and tobacco. Make sure to bring your camera with a wonderfully picturesque and historic view of southern gardens, crops, woodland, and livestock. ‘Grits on the Side’ - What better way to end your historical vacation than with an original musical comedy and authentic local food? Based on dozens of southern legends and myths, ‘Grits on the Side’ is a hilarious and campy spoof of everything near and dear to southerners. This dinner theater provides your group with an authentic country style meal with, you guessed it, grits on the side! With 22 years of making locals and tourists alike laugh, this performance is considered to be the longest running in Alabama. Ron Devane created this comedy and made it full of skits and songs portraying southerners in a fun and lighthearted manner. Take in all the southern food, facts, and fun you can at this dinner theater, a perfect way to cap off your ‘old south’ tour!